This is the first page of the value trend study for George Washington Quarters. Price movements from decades past to the present for coins dated 1932-64 are reported in our Washington Quarter price guide. The Bicentennial era issues of 1975-76 are also listed. The links below are structured to appeal to collectors of George Washington Quarters. There is an in depth table for every coin in the study, covering a wide range of grades. Without a doubt, the Washington Quarter key dates are the 1932-D and the 1932-S. These coins have exploded in value in recent years, owing to the popularity driven to the series by the 50 State Quarter program. This duo will always remain at the top of the heap, so a collector cannot go wrong, at least not in the long term, by purchasing properly graded examples (hint, hint: PCGS or NGC certified). A variety that has just lately gained recognition in Washington Quarter value handbooks, the 1937 Doubled Die, is earning respect from numismatists, as evidenced by quickly rising prices. How high it goes, at this point, is anyone's guess. The George Washington Quarter was first produced in 1932, to commemorate the 200th anniversary of the birth of the first U.S. president and Founding Father. The original intent was that it would sunset after only one year, yet the Washington Quarter remains with us today, an icon of daily American life. We have another section explaining the design selection process and history of the George Washington Quarter. You will find long term value trend online reports for other US coin types by going to the Coin Value Tables online listing page. 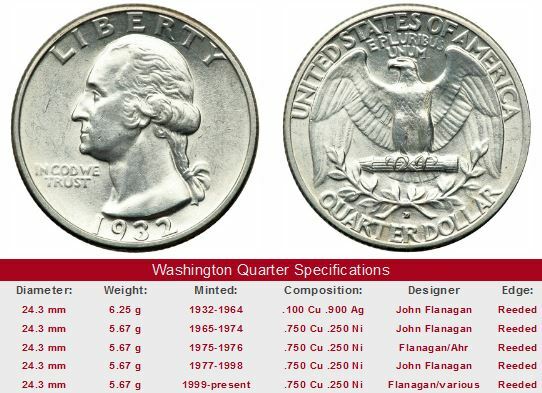 The Coin Value Tables trend data for Washington Quarters reflect the historic availability of numeric grades. For the 1950-1985 rows, the values in the "F-12" column correspond to the "Fine" listing of those years, "VF-20" corresponds to "Very Fine", and so on. The "MS-60" column records the "Uncirculated" value reported during those same decades. Starting in the 1980 row, "Uncirculated" grades are broken down into MS-60 and MS-65 designations. Later years indicate an even wider range of "Uncirculated" grades, as data became more available.